Everyone knows it, and at this point, it goes without saying: college students love pizza. 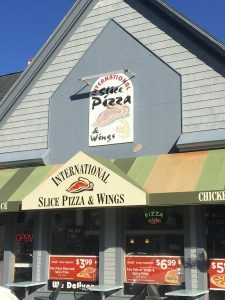 So, I wanted to finally find out just how good the pizza is right at the top of campus at International Pizza and Wings, affectionately referred to as I-Slice. Jon Brock | Essig tries I-Slice’s famous Brooklyn-style pizza. across from the counter and kitchen area. As soon as you walk in the door, you’re greeted with the day’s selection of Brooklyn-style pizza. The menu is right above the window into the kitchen, with standard fare for most pizza shops: pizza by-the-slice or whole, subs, wings, very few pasta and seafood dishes (nothing like those Hard Shell Crabs – Harbour House Crabs delivered), an appetizer menu and the token salad section. Prices are relatively fair, from $2 to $3 a slice depending on variety, and a few combo specials. No matter what you order, a meal for one will most likely come in under $10, even with a side order of fries. For my meal, I decided to stick with the classics and add on a few extras. A word of caution: if you’re eating by yourself, one or two slices would be more than enough, even for dinner, but luckily I had someone else to share with. So, I sampled four different slices of pizza, along with mozzarella sticks and spicy fries. I chose the “Italiano” margherita, meat lovers,’ buffalo chicken and classic pepperoni slices. Out of those four, the traditional pepperoni and cheese slice was by far the best, greatly exceeding my expectations. The crust was perfect, crispy but soft on the inside, and the pepperoni was just oily enough for it to have the right flavor without being overbearing. The cheese was also very good, not too strong but definitely not covered up by the relatively unexciting sauce. Next best was the meat lovers’ pizza, which came with sausage, bacon, pepperoni and diced chicken. The crust stood out again and definitely held it together, even though there were a lot of competing flavors (which I can’t really complain about, because I did order a pizza with four different meats). Next was the margherita-style pizza, which was acceptable for what I was expecting from a non-Neapolitan pizza shop, but the tomato and mozzarella just weren’t very fresh, and were a bit dry, even though the flavor was alright. Coming in last was the buffalo chicken pizza, which was very doughy, undercooked, and overall quite disappointing. It tasted the way it looked: like a slice of cheese pizza with diced chicken and buffalo sauce thrown on it. The ingredients were again good quality, but it just didn’t come out so well. As for the sides, the spicy fries were especially underwhelming: just plain fries with far too little “Cajun” spice and some pepper tossed on them. However, the mozzarella sticks were surprisingly excellent, with deep-fried batter, which didn’t taste anything the like all-too-common pre-breaded frozen variety, and fresh, juicy mozzarella on the inside. The verdict? I-Slice is exactly what you’d expect. It’s cheap, and pretty consistent in taste and quality of ingredients. Despite some minor flaws, it’s lightyears ahead of bland chain pizza shops. If you want to be impressed (and leave satisfied) then stick with a basic slice of cheese or pepperoni pizza, pass on the fancy options, and maybe add on the mozzarella sticks if you’re really hungry.